Associated Bank recently attended Housing Resources, Inc.’s (HRI) second annual “Breakfast with Champions” event at Miller Park, where they were recognized as an “All Star” for working in partnership with HRI to strengthen neighborhoods by supporting local homeowners. Throughout the 2015 baseball season, Associated Bank teamed up with the Brewers Community Foundation to support HRI through their “Hits for Homes” initiative. At the end of the program, the two had raised $100,000, which they donated to HRI’s Minor Home Repair program. Associated Bank and the Brewers Community Foundation also held a tool drive at Miller Park on September 15th to help replenish the HRI tool loan supply. 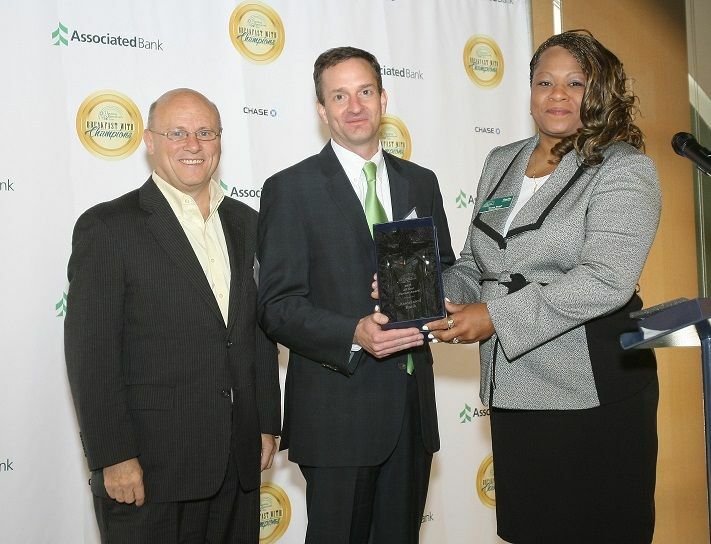 Associated Bank was also recognized with a 2015 Communitas Community Partnership award for its Hits for Homes initiative. Communitas is an outgrowth of the pro bono recognition program of the Association of Marketing and Communication Professionals, a several thousand member group that honors creative achievement and fosters partnerships with charities and community organizations. The Communitas awards program recognizes exceptional businesses, organizations, and individuals that are unselfishly giving of themselves and their resources, and those that are changing how they do business to benefit their communities. Judges found that Associated Bank clearly exhibits the spirit of communitas, a Latin word that means people coming together for the good of a community.